This is my favorite shoe. I love the color – I love that I can slip them on and they actually have a built in arch in this pair! My motto is “Smiling is contagious” so these are perfect and reflect my personality. They are also super comfy. Of course, every girl needs a pair of sparkly magenta colored Converse shoes for when you want to dress up! Now don’t hate on me Panthers fans! I am a big Panthers fan but I am also a Colorado girl raised in Golden Colorado just outside of Denver in Coors country and you can’t take the Broncos out of this Colorado girl! My next pair will be Panthers though which I am sure I will have to get Converse to custom make since I cant find any in the official online Panthers store! On the rare occasion that the Panthers and Broncos play each other, I am a mess! You will find me cheering for both my teams but I do lean a little towards Denver. I know, I know, the Broncos are in the top three worst all time ever Super Bowl games but hey – they did win two! 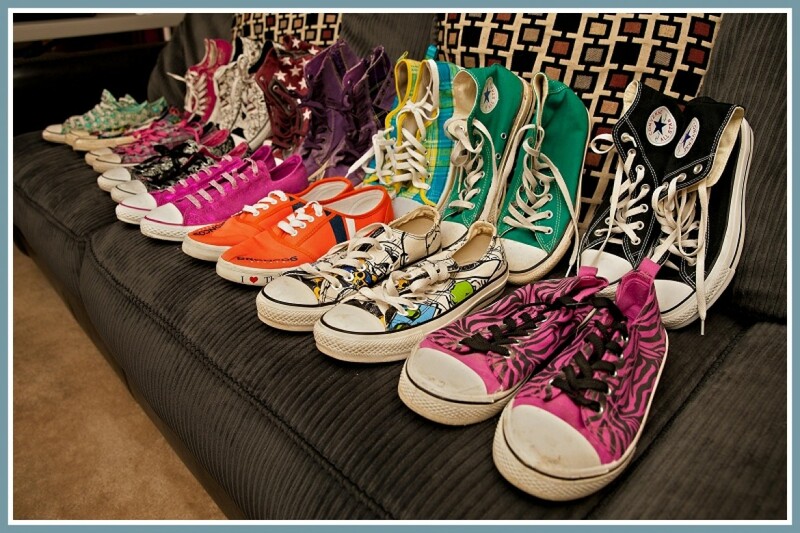 I have to admit that a few pairs are not really Converse but they are close enough!